Founded in 2009, Gili Gili Fast Boat has quickly established itself as one of the most respected and reliable operators in Indonesia. The company noticed a demand for quick and convenient transport between Bali and the Gili Islands, most commonly Gili Trawangan and Gili Air, so capitalised on the market by supplying a safe and speedy mode of transport. Hosting up to 80 individual relaxing reclining seats, a spacious deck area with easy access to a toilet and a full stock of safety equipment, passenger comfort and safety is of paramount importance to the diligent staff on board, elevating the company as one of most popular amongst locals and visitors. The entirety of the staff speak English and are fully qualified professionals, so you can relax amidst the stunning surroundings afforded from the boat, in the knowledge that you are in safe hands. To add to the luxurious experience, whilst you’re basking in the sea breeze and overlooking the azure blue water, complimentary cake, mineral water and face towels are provided. Often travelling between 25-35 knots, the pace of the crossing is a leisurely cruising speed, spurred on by the 250HP engine. Equipped with an LCD TV, sometimes entertainment is offered on some of the sailings, creating a vibrant and buoyant atmosphere. However, the good spirits don’t interfere with the thorough nature of the staff, who will take care of the luggage belonging to the passengers, allowing each person two pieces of luggage. As good as the onboard experience is with Gili Gili Fast Boat, their standout feature is the free transfer to your hotel once at the harbour. Many popular areas are covered in the service, most noticeably to areas such as Sanur, Tanjung Benoa and Padang Bai. Directferries.com provides an impartial ferry comparison service allowing you to view numerous ferry company timetables and fares in one quick and easy search. 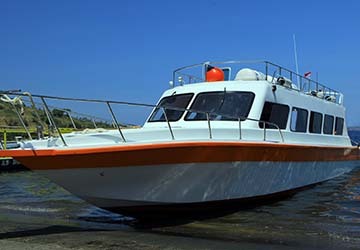 Compare Gili Gili Fast Boat timetables and prices now with all alternative ferry operators before booking your ferry ticket.